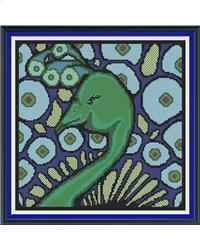 A beautiful art deco peacock design produced from the original artwork of Amy-Elyse Neer. I work with this artist to turn her work into cross stitch. Whole stitches only, and some long stitch make up this square picture. Would be great as a cushion front.